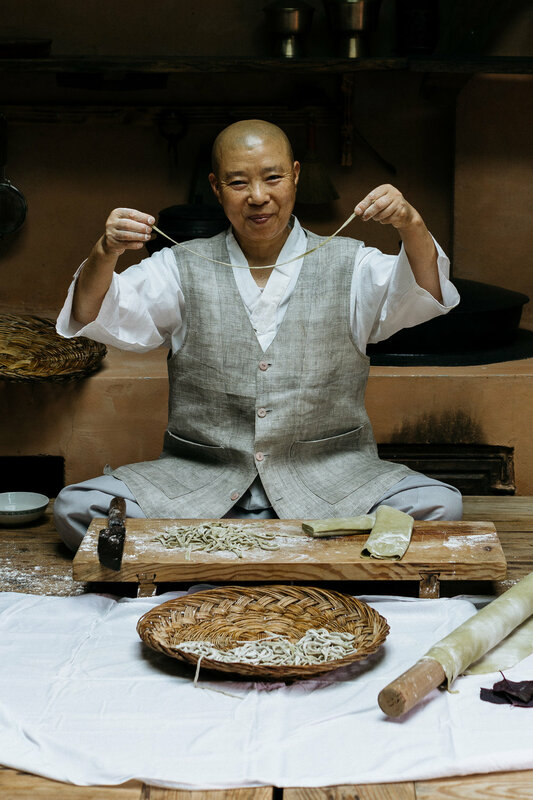 Jeong Kwan seunim does not have recipes. She declares this at the start of a Sunday cooking class, as she is encircled by students who have travelled long distances by plane, train, bus, automobiles, and even by foot to Chunjinam hermitage to, well, learn recipes from her. Eyes widen. These people have not grown up in my family. All great cooks in my family (and likely yours as well) have not had recipes. “I don’t have a recipe” is the maddening refrain I’ve heard every time I asked my mother or aunts to share with me how to replicate a delicious garlic stem pickle or a crisp white kimchi. I’ve heard it over the phone when I was in university and missing my mom’s cooking, over text messages and emails. I’ve heard it in person when we’re in the kitchen preparing dinner where I can see they clearly know how to make a dish because they are making it before my very own eyes. My aunt, who barely speaks English, will wave me away, saying in English, “no recipe, no recipe!" “Can you please try to explain?” I plead. There’s always a dash of soy sauce, maybe a splash of sesame oil, and a smidgen of garlic, though if the garlic is not as fresh, maybe a little bit more. 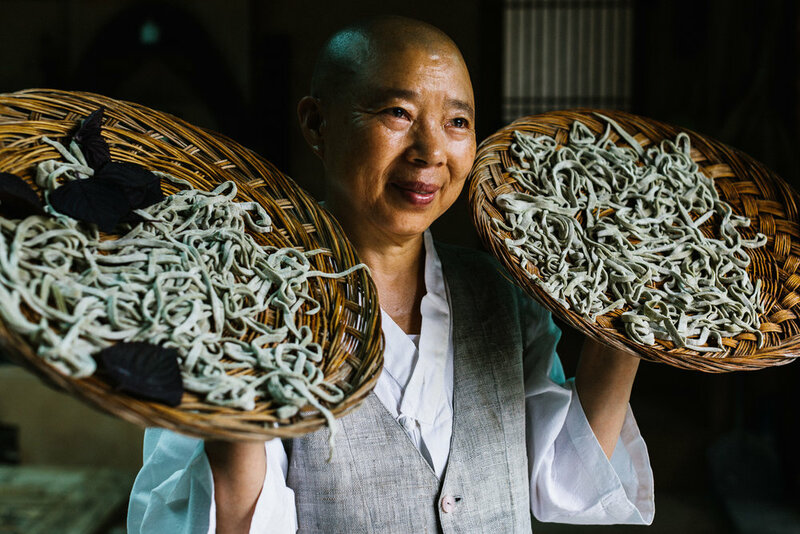 As Jeong Kwan says, every dish is different every time she makes it. How she makes a dish all depends on for whom she’s cooking or with whom she’s cooking. The ingredients, seasons, weather, so much can affect how you cook a dish. Cooking is variable, fluid, refuses to be pinned down by the confines of something as banal as a fixed recipe. I love the philosophy that food is not something over which you can be the master. The chef is the one who must bend to the will of the food. My dad likes to say that we must bend like bamboo in the wind as we go through life, and when he waves his arms in the air like supple bamboo, people laugh. And as much as that sounds like a quote from an old kung fu movie, it is a truism in life and in cooking. Slow food means you wait for the food to cook at its own speed, not at your speed. Jeong Kwan seunim goes on to say as she patiently watches a shiitake mushroom braise in her homemade soy sauce. Treat the ingredients with respect. When you’re cooking, handle the ingredients as if they were a part of your body, she says as she lifts a bitter gourd with one hand, the vegetable an extension of her arm. 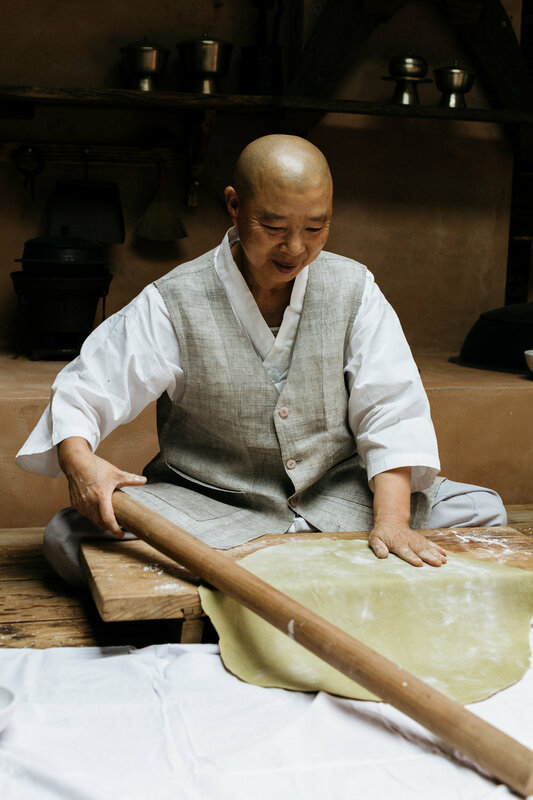 Watching Jeong Kwan seunim cook, listening to her thoughts on the food as she cooks, is to observe a respectful exchange between chef and the ingredient. She takes care with her ingredients, spends time to learn about their condition and understand them, doesn’t rush and exudes appreciation for being able to cook with them. This was no more evident than when I watched her make handmade, knife-cut noodles for us for lunch during my last stay. 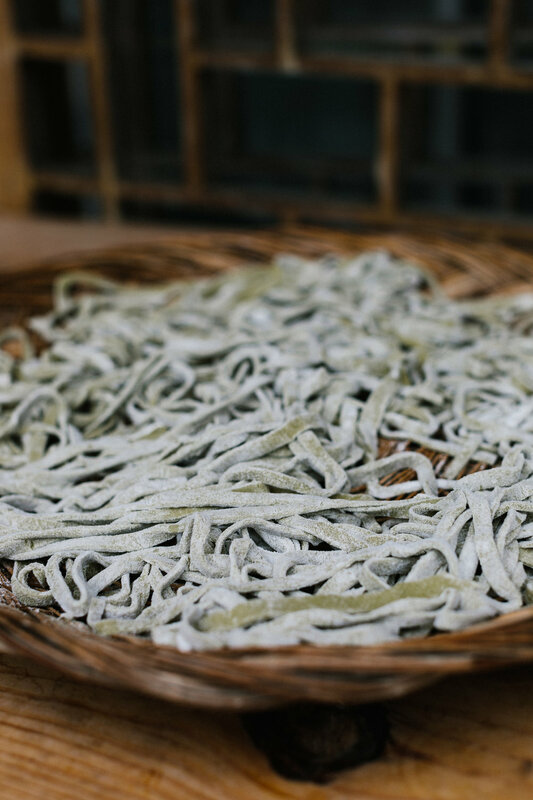 If you’ve watched the Chef’s Table episode on Netflix on seunim, you will have heard her story of how she surprised her parents by making these noodles for them when she was just a small child. By my estimation then, she has been making these noodles for maybe fifty years. And yet, she has no recipe. She improvises the dough, wondering out loud to herself if she should add buckwheat flour this time. 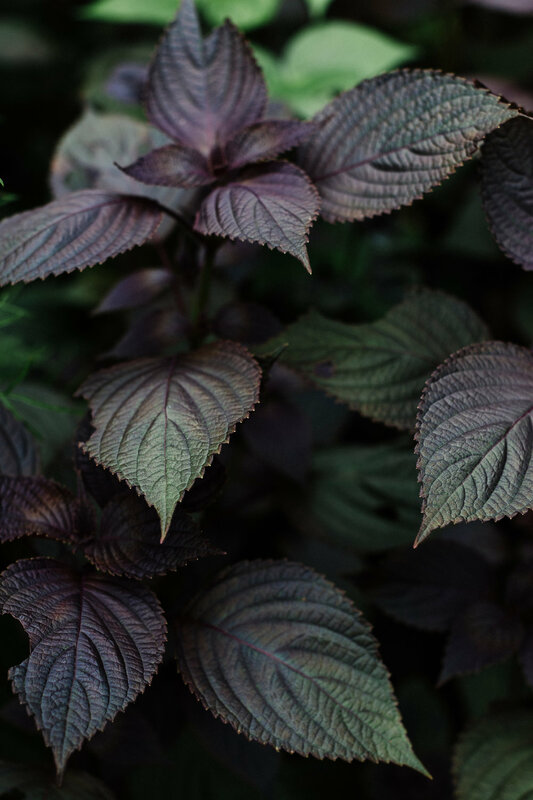 Her garden is heaving with purple shiso leaves at the moment, so she has someone gather a handful of the dark, glossy leaves. She purees the fragrant shiso in water and uses that liquid to wet the flour and make the dough. Every step as she makes the noodles feels like a meditation. When she kneads the dough seemingly interminably, as she sifts flour over the wooden board on which she works. Every movement is made with intention and grace. She seems to barely notice our presence in the room as she rolls out the dough, using deliberate, fast, even strokes. The consistency with which her two hands roll the wooden pin is mesmerising. Once the dough is thin enough, she folds it together delicately, sprinkling flour between the folds and then cuts the dough into strands. Soon we have two baskets covered with her handmade noodles. 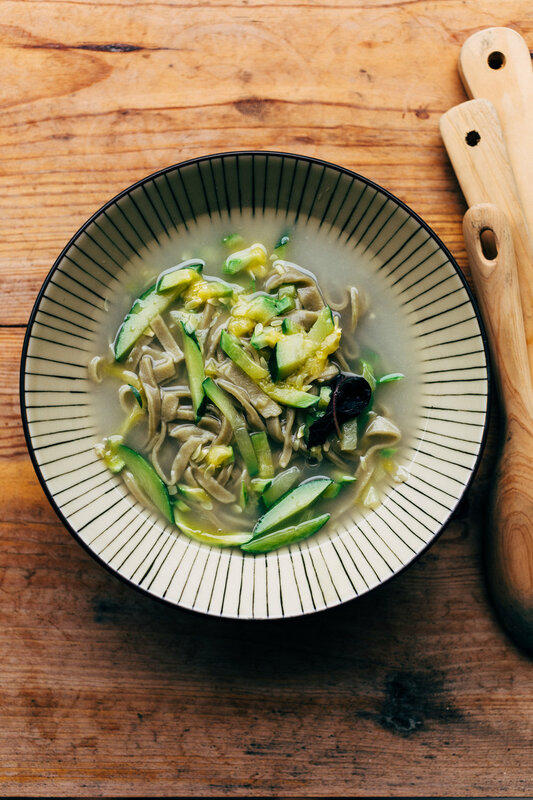 To not overwhelm the delicate flavour of the shiso, she serves them in a light vegetable broth seasoned with soy and perilla oil and tops them with julienned courgette. It was a lunch made with love and decades of the seunim’s history underlying it. We were grateful to have been there to watch her make it and then slurp down the lightly fragranced noodles. How delicious and easy, and yet I don’t have a real recipe of hers to share with you. Below I outline a rough recipe, with the ingredient measurements adapted from Emily Han on The Kitchn. 1. Puree the shiso leaves in the water. 2. Combine the dry ingredients for the noodles in a bowl. Create a well in the center and add the oil and rub into the flour with yours hands. Then add and fold the water into the flour with your hands to combine and make a ball of dough. 3. Turn the dough onto a floured board and knead for at least 10 minutes, until the dough is evenly combined and pliable. Set the dough aside, covered, for 30 minutes to rest. 4. Once the dough has rested, roll the dough out to desired thickness. These noodles should not be too thin; they should have some bite to them. 5. Dust both sides of the pasta sheet with flour and fold it over four times. Do not squash the dough. 6. With a very sharp knife, cut the dough into thin strands. 7. Toss the strands generously with flour as you separate them and place them in one layer on a basket until ready to cook. 8. Boil the noodles in salted water for a few minutes until they float and then immediately place in ice water. Rub the noodles together in the ice water to remove excess starch. Drain and coat with perilla oil so they don’t stick together. 9. Boil the vegetable stock and season to taste with salt and soy sauce. Add the courgette and simmer for a few minutes. 10. 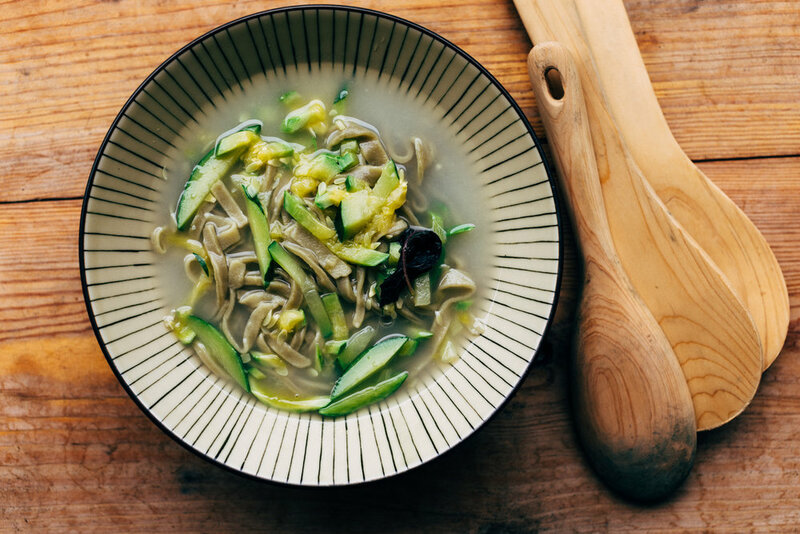 Place the noodles in a bowl and top with the stock and courgette. 11. Garnish with more perilla oil. PS. I am organising an event in Hong Kong with Jeong Kwan seunim on 24 October, in conjunction with the Asia Society of Hong Kong and the Korean Consulate of Hong Kong. Those who attend will be able to hear from her directly as she does a cooking demonstration and I have a dialogue with her on stage. Tickets for the event will be on sale later this month through the Asia Society. Stay tuned for more details!